Residents of Raalkuli in the Trincomalee district were in a jubilant mood Tuesday morning, saying it was a day of special significance in their lives when the Country Director of the Asian Development Bank (ADB), Mr.John R.Cooney, made his first ever visit to the Raalkuli village using the new ferry boat supplied by the ADB funded North East Community Organization for Restoration Development (NECORD). The LTTE's Trincomalee district political head, Mr.S.Thilak, NECORD Project Director Mr.T.Lankaneson, Deputy Director Mr.R. Umakanthan and Muttur Divisional Secretary Mr.A.Nadarajah accompanied Mr.John R.Cooney in the new ferryboat to the village. 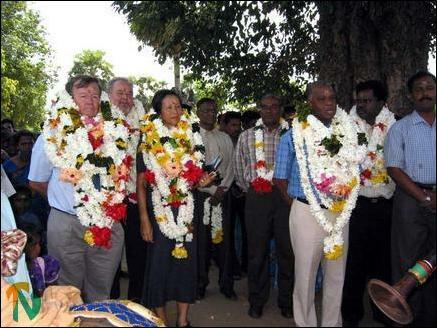 The residents of Raalkuli gave a rousing welcome to Mr. and Mrs. Cooney, Mr.Thilak and officials of the NECORD Tuesday morning. Men and women, young and old, lined up both sides of the road keeping " Poorna Kumbam" at the entrances of their houses and received the guests by garlanding them. The guests were taken in a procession with traditional Nathaswaram music; the Western band of Muttur St. Antony's School was also in attendance. The road that leads from the ferry landing point to the Raalkuli government Tamil school was gaily decorated. Addressing the meeting held later at the school hall, Mr.Thilak, the LTTE political leader, said Raalkuli was a "forgotten " village in the Trincomalee district. Only now it has gained attention in the sphere of development. Mr.Thilak commended the NECORD for coming to the rescue of people wherever they undergo suffering. 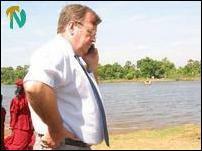 ADB Country Director Mr.John Cooney speaking on satellite phone close to the banks of the Mahaweli river that separates the mainland from the Raalkuli village, which is seen in the background. Presiding over the event, the Muttur Divisional Secretary, Mr.A.Nadarajah, said residents of Raalkuli fled to Pachchanoor and sought refuge in a camp there following the outbreak of violence in 1990. The residents led a refugee life for seven years and as a last resort they returned to Raalkuli voluntarily in 1997. 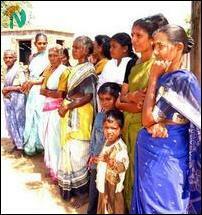 The government authorities did not allocate a single cent for the rehabilitation of the resettled families. Since then, the Raalkuli villagers are leading a miserable life without any basic facilities being provided by the state agencies. Villagers find it difficult to market their produce for good prices due to lack of transport facilities. They are unable to launch any self-employment project and cash crop cultivation in the lands as the village has not been supplied with electricity. NECORD Project Director Mr.Lankaneson found the villagers leading a life without basic amenities during one of his visits to the village. 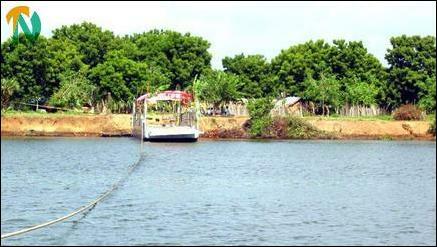 Thereafter NECORD initiated several development projects in the village including school buildings and ferryboat service. "Today is a red letter day for the people of Raalkuli. 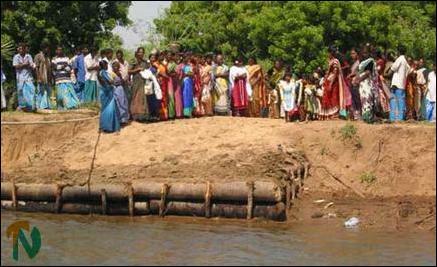 They finally have got a ferryboat service due to the untiring effort of the NECORD," Mr. Nadarajah said. Mr.Lankaneson said ADB's Country Director Mr. Cooney witnessed the deplorable state of the access road that leads to Raalkuli from Muttur town. Mr. Cooney has agreed to repair the access road as a NECORD project. Mr.Cooney in his speech said, "We spend so much time with paper work, meetings and other things that we do not have time to see what the project means. The visit to Raalkuli has given us a wonderful opportunity to see the real impact of the project." He added, "The ADB is working on a much larger project that we hope to start early next year. There will be many more roads and ferries for villages like Raalkuli. We will continue to assist as long as necessary. This project is a small start in helping the people of the northeast." "We will never forget the visit to Raalkuli and the people of Raalkuli. We wish you all the best of good future," said Mr.Cooney. Raalkuli, a Tamil village in the Muttur division, south of Trincomalee town, is separated from the nearby villages in the mainland by the Mahaweli river. Raalkuli is one of the remotest and backward villages in the LTTE held area in the Muttur division where 300 families with about 1500 persons live. The majority of the villagers are engaged in fishing, animal husbandry and cash crop cultivation, sources said. There was a ferryboat service maintained by the Road Development Authority in Raalkuli that transported the people of the village to the mainland, but the service was suspended following the displacement of the villagers. The NECORD has now provided a new ferry service. Mr.Umakanthan, the NECORD's Deputy Director in the Trincomalee district, also spoke at the meeting.